Discussion in 'vBench (Works in Progress)' started by KenBoyle, Sep 2, 2017. 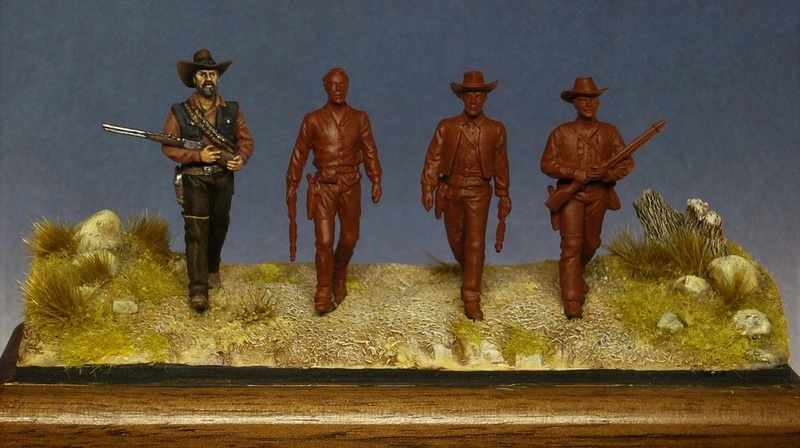 As I mentioned in my earlier WIP Oniria US Cavalry thread, my current project is an Oniria 36mm four figure vignette from the Sam Peckinpah 1969 western movie "The Wild Bunch". The four figures are a small subset of the cast and include, Ben Johnson, Warren Oates, William Holden and Ernest Borgnine. It's 1913, and the traditional American West is dying. An old outlaw gang, which includes the four men mentioned, heads to Mexico determined to do one last job. In this scene, near the end of the movie, the four gang members are armed to the teeth and walking into a Mexican town to rescue their friend Angel, played by Jaime Sanchez, from Mexican soldiers. 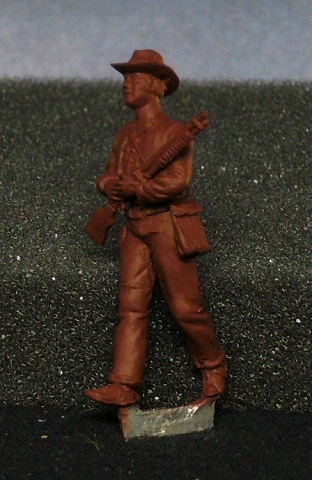 The 36mm figures in their walking position are too small to effectively pin them to the base. 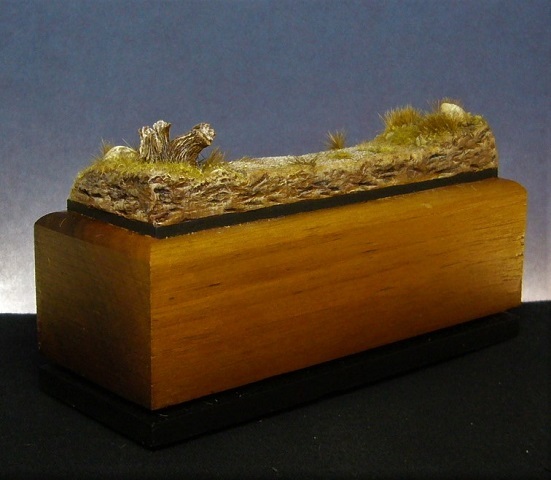 Fortunately, they come with a cast tab on the bottom that is designed to fit a standard slotted wargamer's base. Since I wanted them on my own collector's base, I needed to construct the base first and push them into the clay to create the slots before any painting could begin. 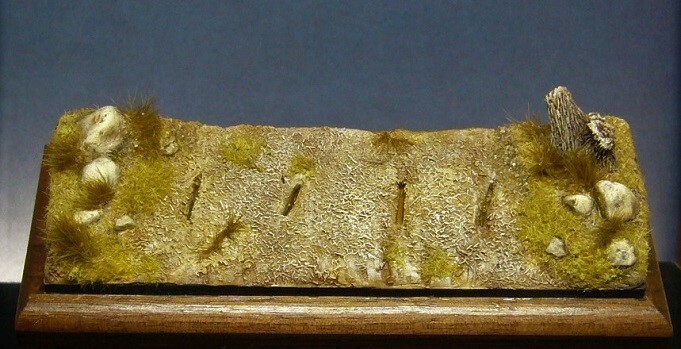 Once the figures are painted, I will add them to the base and add some dirt around the slot/tab to conceal it. Once the base was completed, I went ahead and painted it. I'll touch up any issues at the end. Since they are walking abreast and I didn't want a overly large base, I selected one of my own 54mm mounted figure bases. A little unusual but it works, I believe. 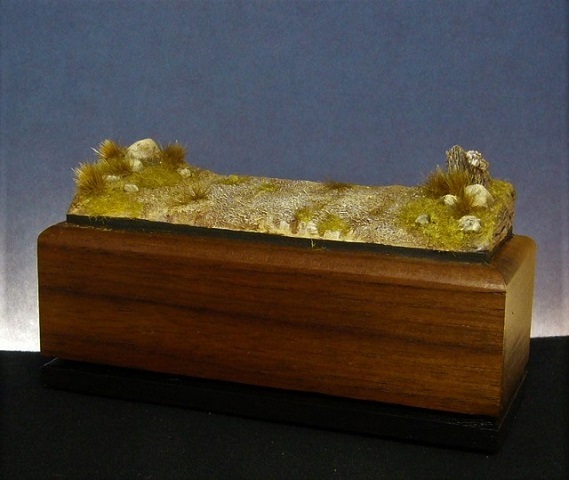 I used Magic sculpt, a resin tree stump and a few pebbles to create the ground work. I wanted the impression of a road leading into the town. Thus my vignette takes place a few minutes prior to the photo from the movie. Otherwise I am trying to be as true to the movie photo as possible. My thanks to Oniria for making this relatively easy. 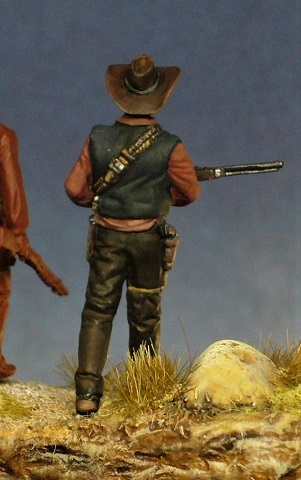 Next post includes the first painted figure representing actor Ben Johnson. oniria, stoffy01, Dan Morton and 6 others like this. 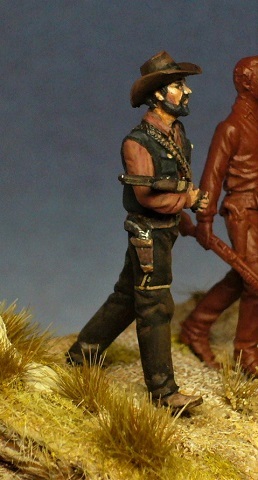 Ok, as promised here is the first painted figure, actor Ben Johnson. I included the rest of the figures, in primed form, so you can see where I'm going. 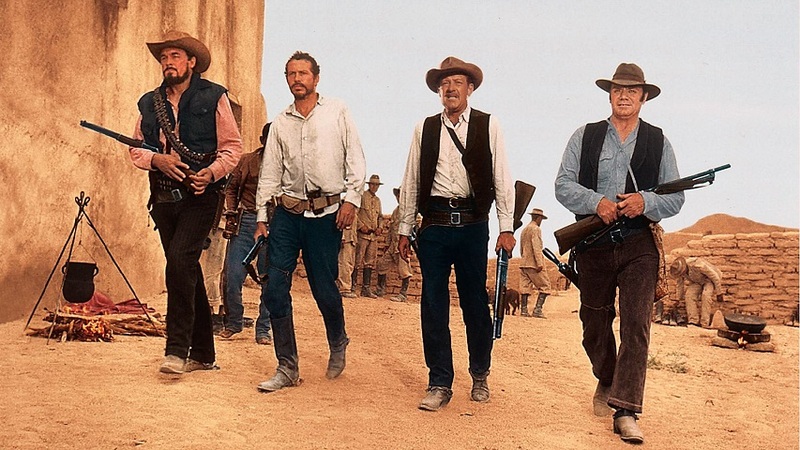 From left to right, Ben Johnson, Warren Oates, William Holden and Ernest Borgnine. oniria, stoffy01, Dan Morton and 13 others like this. Yes the base looks spot on. Thanks Phil and Mark. Much appreciated. Do you have this set as well? oniria, stoffy01, Mirofsoft and 5 others like this. oniria and KenBoyle like this. and i thought 75mm was tricky to paint ... congratulations : very nicely done scene ! This is really nice. 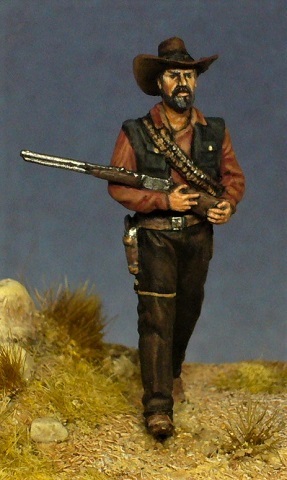 I have the Oniria "Wild Bunch" kit of Pike (William Holden) with the machine gun on the table. It's on my list of things to do. This is really a neat diversion from 54mm+ and busts. I love that I can paint a smaller figure in 6 hours or so, (compared to days for a larger figure) even though there are several to paint per project. However, I will always go back to the larger figures as my bread and butter choices, although for multiple figure vignettes/dioramas, these can't be beat. I didn't realize the other ones were modified from the original set.They look good though.Angel (Oniria) loves the old movies so look for some more cool sets in the future. His staple range is his Napoleonics though. Terrific! One of my all-time favourite films,too. Great characters, you're doing a grand job bringing them back to life. Huw63 and KenBoyle like this. I love doing movie related figures, although they can be a bit "Hollywoodized" on details. Nevertheless, it's great fun! Can't believe I missed this one, nice scene and painting. Great film too and have just seen the remake. What was the remake.I haven't heard nothing about that. The only remake, I was aware of, was supposed to be a loosely based contemporary version starring Will Smith and the CIA vs the Mexican drug cartel . But I never saw that it was actually released. Is there another one? Ok, just saw your post of Magnificent Seven. That was a remake of a different movie, not the Wild Bunch. Got it. marco55 and Viking Bob like this.